PAUL DORPAT is a longtime Seattle resident. Paul has produced documentaries for local television, lectured widely, and since 1982 has written the weekly column, "Now and Then" for the Seattle Times. Included among his dozen published books are three volumes of Seattle "now and then" comparisons drawn from his column and Building Washington, an illustrated encyclopedic study of the state's historical development that he co-authored with Genevieve McCoy. 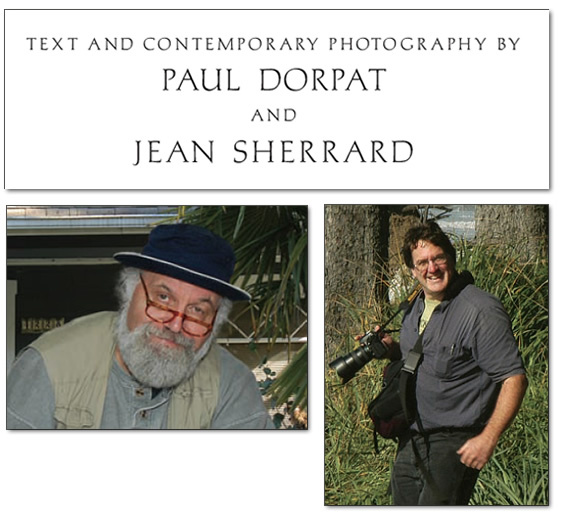 Dorpat's collaboration with Jean Sherrard began in 1999 with the production of bumberchronicles, a video history of Bumbershoot, Seattle's annual arts festival. JEAN SHERRARD has worked as an actor, writer, director, photographer, teacher, carpenter and private detective. Co-founder of the Globe Radio Repertory, he wrote and directed scores of radio plays for National Public Radio and has trod the boards of Seattle's finest theaters. His photos and articles have been featured in numerous publications. With Paul Dorpat, he co-produced Bumberchronicles, a KCTS-9 documentary, and co-wrote Legacy, a commemorative history of the Kreielscheimer Foundation. Currently, Sherrard teaches drama and writing at Hillside Student Community, a private secondary school in Bellevue, Washington.